Albert Mirindi is a UN Volunteer currently based in the Mali office of the United Nations Development Programme (UNDP). Hailing from the Democratic Republic of Congo. he serves as a Gender Specialist/Gender Advisor on a project supported by the Peacebuilding Fund, working to build resilient communities in Mali by ensuring that women are drivers of peace and decision-makers. Albert Mirindi is a UN Volunteer currently based in UNDP’s Mali office working as a Gender Specialist/Gender Advisor on a project supported by the Peacebuilding Fund. 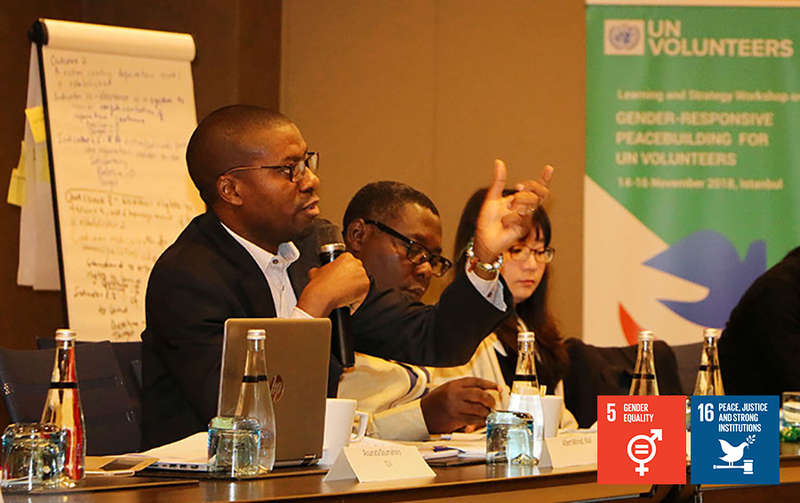 Here he takes part in the Gender-responsive Peacebuilding workshop for UN Volunteers in Istanbul, Turkey. My goal is not only to make sure that women are drivers of peace and decision-makers in the advisory committees during negotiations with armed groups, but also to see that women are actually able to take decisions when they are at the table and that their decisions are respected. I am proud to say that since the project started, we see that the number of women in the advisory committees has increased – from zero to four! Our project also supports employment opportunities for young women and men, as it contributes to longer-term vision for peace in Mali. There are women working with electricity and machinery [jobs that are traditionally not seen as women’s jobs] after receiving vocational training and job placement through the Peacebuilding Fund. It’s a great investment in sustaining peace and economic revitalization of the country. I am very happy with my work, being a man who works among all these women on gender issues. It’s men who can convince other men about women’s rights. If it’s men who are advising other men to respect women, there’s a better chance that they would listen and think of changing their behaviours. Albert recently participated in a learning workshop on gender-responsive peacebuilding, organized jointly by UN Women, Peacebuilding Support Office (PBSO) and the United Nations Volunteers (UNV) programme, which aimed to build capacity and exchange experiences of UN Volunteers working on the projects supported by the Peacebuilding Fund under its Gender and Youth Promotion Initiative. Albert's work contributes towards the Sustainable Development Goals – Goal 5 on gender equality and its target on ending violence against women and girls, as well as Goal 16, which promotes peaceful and inclusive societies, provide access to justice for all and build effective, accountable and inclusive institutions at all levels. UN Women first published this article to mark International Volunteer Day 2018 by celebrating the important contributions of UN Volunteers working to build resilient communities by ensuring that women are drivers of peace and decision-makers.